Phoenix Sky Harbor International Airport was recognized as a newly-accredited airport in the Airports Council International – North America (ACI-NA) Airport Carbon Accreditation program. Airports attain this accreditation by managing and reducing their carbon footprint. In 2014, Phoenix Sky Harbor set a goal to reduce its carbon footprint 10 percent by 2020. Between 2014 and 2015, Sky Harbor already decreased its carbon footprint by more than 4 percent. Decreasing energy consumption and using renewable energy are two major factors in the reduction of an airport’s carbon footprint. Officials from the city of Phoenix and Valley Metro, alongside community representatives, gathered today to announce the first light rail project slated under Phoenix Transportation 2050. The new 50th Street Station will serve local businesses and provide added convenience for riders who are traveling from across the Valley to access independent lifestyle resources for people with disabilities at Ability360. Ability360 was a catalyst in the development of the new station. The City of Phoenix will select its first Poet Laureate early next year. Mayor Greg Stanton and Councilwoman Laura Pastor -- who chairs the Parks, Arts, Education and Equality subcommittee – called out writers to apply and outlined the nomination process to celebrate Arts and Humanities Month this October. Supported by the Phoenix Office of Arts and Culture and the Phoenix Public Library, the selected poet laureate will begin a two-year term beginning January 2017. For a limited time, Allegiant Airlines is offering discount flights from Cleveland to Phoenix. 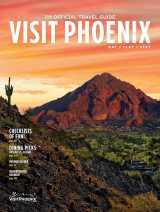 This getaway deal with be offered Phoenix-Mesa Gateway Airport, Arizona; service starts Feb. 17 and ends May 15. Fares will start at $64. FOUND:RE Phoenix is set to open Oct. 25. The 105-room brand-new lifestyle hotel will be a one-of-a-kind experience with details, designs, public spaces and amenities inspired by contemporary art, culture, fashion and music. The hotel will enhance the city’s arts offerings with an impressive collection of contemporary art and creative guest programming woven into the entire guest experience for visitors and locals to enjoy. The modern hotel will contain a dynamic art component let by Cultural Curator Michael Oleskow who will be sourcing contemporary art of various mediums by local artists at that will inspire creative guest experiences. The collection is intended to complement the decor and guest programming, including an on-iste art gallery and exterior avant-garde art display. The FOUND:RE will be partnering with prolific designs partners to create and industrial, raw design and aesthetic throughout, with furnishing and touches such as concrete floors, exposed ceiling and floating beds. The hotel will also have an on-site restaurant, MATCH Cuisine & Cocktails that will offer a creative menu of sharable plates focusing on eclectic, globally-inspired street food. The FOUND:RE will be another layer of creativity in Phoenix’s growing art community, embracing its urban location with nearby art galleries, the Phoenix Art Museum and creative pop-ups. The independent lifestyle hotel, The Camby is giving meeting planners and business travelers something to cheer about. They now have access to more than 23,000 square feet of flexible indoor and outdoor luxury meeting space complemented by smart technology expertly woven into the meetings experience. Meeting rooms play off this whimsical and design-centric theme with names such as Pima (cotton) and Rustler (cattle). New to the hotel, curated Mini Meetings experiences are available for 10 - 24 guests, including catering options crafted with the same creativity as the signature restaurant, Artizen, Crafted American Kitchen & Bar. Creative team building activities such as “How to Tie a Bow Tie” are available, as well as personal meeting concierge. Nestled on 316 scenic acres in the heart of the Sonoran Desert, the JW Marriott Desert Ridge Resort & Spa is offering the epitome of luxurious fall fun this season for adults and couples with its Come to Life Griffin Club Experience package. Couple that with four acres of shimmering pools and lazy river, a full-service spa, 36 holes of championship golf and six restaurants offering a festival of fall flavors. The Griffin Club Experience package includes deluxe accommodations with scenic views, access for two to its exclusive Griffin Club, a $50 resort credit per night and a late 3 pm checkout. Rates for this exclusive offer begin at $289 per night. This offer ends Dec. 26. AC Hotels make its debut in Greater Phoenix with the recent opening of the AC Hotel Phoenix Tempe. AC Hotels celebrates the beauty of classic modern designs with its European soul and Spanish roots, born from the signature vision of renowned hotelier Antonio Catalan, who founded the brand in 1998 and grew it into one of the most well-respected hotel brands in Spain. Following its success in Europe, a joint venture was formed with Marriott International in 2011, which launched AC Hotels by Marriott globally into France, Italy, Portugal, Denmark and the U.S. Based on a belief that purposeful design improves lives, AC Hotels carves away what is unnecessary, in order to provide guests with thoughtfully designed moments of beauty; moments that elevate their stay and help them focus on what is important to them. That is why at all AC Hotels guests get only what they need, without paying for what they don’t. The result is sophisticated yet unpretentious style, innovative beverage and food programming and locally inspired experiences for both guests and locals. Whether you’re enjoying a weekend getaway or a longer escape, relax, reconnect and make the most of every moment. Golf, spa or a special dinner? Choose your own special experience with the Choose Your Fall Fun Getaway offer at The Westin Kierland Resort & Spa which includes a $100 per room, per night resort credit. Fall Fun Getaway rates start from $289 and include a $100 daily resort credit. The offer is available for stays from November through the end of December 2016. The Phoenician will once again showcase its celebrated Afternoon Tea experience at the Sixth Annual Bentley Scottsdale Polo Championships: Horses & Horsepower, Nov. 5, 2016, beginning at 12:30 p.m. The award-winning culinary offering will feature The Phoenician’s traditional house-made assortment of delectable finger sandwiches, freshly baked scones (with Devonshire cream and fruit preserves), petit fours and signature teas – served with the resort’s elegant, fine china. In addition to the full tea service, guests can enjoy shaded, field-side tent seating for all of the day’s festivities at WestWorld of Scottsdale – including four polo matches; a cultural concert with performances by the Arizona Opera and Scottsdale Philharmonic, among others; and a fireworks finale. A no-host bar will be conveniently located within the tent for champagne, cocktails and additional refreshments. Individual tickets for this experience are $125; front-row tables for two are $400; second-row tables for four guests are $700; and third-row tables for eight guests are $1,500. Phoenician tent seating is limited to 150, with advance purchase required. To recognize their ten consecutive years as a AAA Four Diamond Award recipient and the addition of the another significant industry award to its trophy case: the highly acclaimed TripExpert “2016 Experts’ Choice Award,” the We-Ko-Pa Resort & Conference Center is offering A Decade of Diamonds group sales and catering promotions to encourage meeting and event planners to organize their next company outings, trade shows or team-building retreats at this independent golf resort nestled in the breathtaking Sonoran Desert. From now until Dec. 31, groups can experience luxurious accommodations and lavish amenities, like teeing off on We-Ko-Pa Golf Club’s two award-winning courses, with a discount. The new group sales promotion includes 10 percent off published banquet menus, 10 percent off transportation, 10 percent off spa services, $10 off resort fee, $10 off golf, $10 chair massages, $10 refreshment breaks, $10 gas card for site visit or $10 slot credit. There&apos;s no better place to take in Arizona&apos;s signature painted skies than at the Fairmont Scottsdale Princess for al fresco dining. Share your favorite #PrincessSunset photos with us on Instagram for a chance to win a 3-night Sip, Savor & Sunset stay. Great golf happens here. The Fairmont Scottsdale Princess is proud to partner with Golf Digest as the official lodging destination of &apos;The Gauntlet&apos; Golf Decathalon, Dec. 7-11. In conjunction with Scottsdale Golf Week, this four-day special event is a one-of-a-kind golf and gastronomy adventure that can&apos;t be missed. This October, celebrate the season with pumpkin food and beverage specials throughout the day at Proof, at the Four Seasons Resort Scottsdale at Troon North, as well as a three-course, Oktoberfest beer-pairing dinner on Oct. 8. Proof diners can greet the day with pumpkin spice pancakes with cinnamon whipped cream, cranberry compote and streusel topping, or savor a warm pumpkin spice coffee cake. Lunch and dinner specials include roasted pumpkin maple soup with fried sage, pumpkin seeds and crispy house made bacon, along with pan-roasted duck breast with roasted pumpkin hash, fried Brussels Sprouts and spiced persimmon chutney. For dessert, a pumpkin pie sundae with house made pumpkin ice cream, caramel sauce and cinnamon whipped cream completes the meal. Best of the best in the Southwest. Expedia.com®, one of the world&apos;s largest full service online travel sites, named Talking Stick Resort one of 2015’s “Best of +VIP Access” winners. Talking Stick Resort was named “Best of the Best” in service and was the winner out of 18 hotels in the Phoenix area. Worldwide, this annual award is only given to 300 of Expedia’s top rated +VIP Access hotels, which receive the highest customer satisfaction scores and popularity from Expedia’s qualified elite status members. This is the second year in a row that the resort has received this award. Jazzing up Phoenix since 2012, The Jazz Forward Coalition has named The Nash, the popular jazz venue in downtown Phoenix as one of 4 partners in its national "jazz hubs" initiative. The Nash, along with major jazz venues in Pittsburgh (MCG Jazz), Washington D.C. (Smithsonian Jazz) and Portland (PDX Jazz) will lead the Jazz Forward Coalition, funded by the Doris Duke Foundation, to pilot a "jazz network" to strengthen jazz&apos;s cultural presence in the United States. In this leadership capacity, The Nash will share and help create "best practices" for audience development, community engagement and programming for jazz venues across the nation. The four hubs will participate in an 18-month pilot program focused on resource and capacity building through national and local summits. The Nash is celebrating its 4th year since opening its doors on Roosevelt Row with an all-out Birthday Bash, Oct. 7-9. The weekend includes performances with a quintet of heavy hitters, The Lewis Nash Big Apple Quintet. Get ready for some Rap, croon with some Country, dance with EDM, and reminisce with Alternative favorites, and rock out with, well, ROCK. This year’s Veteran’s Memorial Coliseum Concert Series at the Arizona State Fair features an impressive line-up with top headliners from a variety of genres. General admission seating at the concerts is free with Fair admission on a first- come, first-served basis the day of the show. Celebrate a fall tradition with Desert Botanical Garden and carve new memories at The Great Pumpkin Festival. Take a hayride out to the Garden’s Pumpkin Patch, where children 12 and under can find a perfect pumpkin to take home. Attempt the amazing hay bale maze, decorate your pumpkin and visit the Community Garden to see how pumpkins and other vegetables grow. In the Garden’s Events Plaza, test your skills on carnival-style games, dance to family entertainment, meet adorable farm animals and purchase pony rides. Snack and lunch items will be available for purchase from Fabulous Food Fine Catering and Events and some of the Valley’s food trucks. Food concessions, pony rides and Harvest Market items are an additional charge. This event takes place Oct. 21-23. Strange things are happening at the Pueblo Grande Museum. Local indigenous artist collective Radio Healer for an immersive performance on the back patio of Pueblo Grande Museum that uses tools, regalia, video, and sound to perform artworks that make the everyday familiar seem strange. Using indigenous tools, which they created, Radio Healer performs re-imagined indigenous ceremonies that include amplified experimental music and sounds with oversized projections of video. Following each performance, members of the audience will have the opportunity to ask questions, and speak directly with the artists. This after-hours event is free and open to the public, donations are welcome. The first performance will take place on Oct. 28 at 7 p.m.
Kehinde Wiley: A New Republic -- a comprehensive career retrospective of the New York-based contemporary artist -- is opening at Phoenix Art Museum on Oct. 7 at 6 p.m. A New Republic, which originates from Brooklyn Museum, will feature nearly 60 of the artist’s works, including his signature large-scale paintings that depict young, contemporary, multicultural men and women in the context of classical European portraiture traditions. On opening night of the exhibition, First Friday, Oct. 7, the Museum has planned a celebratory event to match the scale of Wiley’s work. Exhibition opening night highlights include: free general admission from 6 p.m. to 10 p.m. (special exhibition fees apply); Music by DJENTRIFICATION; Arizona Opera; Maryvale High School Marching band; and a free show by Phoenix Afrobeat Orchestra at 9 p.m.; Portrait photography; and live model sketching. Join Pueblo Grande Museum for the premiere of One World, Many Voices: The Artistry of Canyon Records, a comprehensive photographic, musical, and historical exhibit of a unique record company at 7 p.m. on Oct. 20. Founded in 1951, Canyon Records is one of the oldest independent record labels that produces and distributes Native American music. Recent recipient of the first Governor’s Arts Awards for Small Business, Canyon Records is also one of the oldest cultural institutions in Arizona. One World, Many Voices will feature over 40 images of Canyon Records artists, including R. Carlos Nakai, Tony Duncan, Radmilla Cody, and others, photographed by Robert Doyle, president of the company. In addition to photography, the exhibit showcases items from Canyon&apos;s 65-year history, instruments from artists, videos, and will premiere original music composed exclusively for this exhibit. As a special interactive experience, guests will have the opportunity to pose for pictures with the Canyon Records GRAMMY © Award. One World, Many Voices is an immersive experience that provides a detailed look at Native American recording artists, the record company that supports them, and how Doyle brings it all together. Locally owned Mortimer Farms has announced it will once again hold its annual Pumpkin Festival & Corn Maze event every weekend in October including Columbus Day. At the center of this huge festival will be the farm’s 40-acre Pumpkin Patch plus a 15-acre Corn Maze. Every year the Mortimer Family cuts the corn with a descriptive picture in the middle of the maze. Last year was the logo of the Phoenix Children Hospital. This year the corn is sculpted into a picture of Donald Trump and Hillary Clinton dancing hand in hand. Gary and Sharla Mortimers’ goal is to create memories for families plus share their love and passion for agriculture on the 300-acre farm. As in past years, there will be many attractions, games, farm activities, hay rides, entertainment, and much more. The brand new Farm Park features educational interactive display boards, old fashion farm rides and new this year Gem Mining. Hop to it. Jackalope Arts announces the return of their Indie Artisan Market, Jackalope, Nov. 26 and 27, at WestWorld of Scottsdale. This year&apos;s market will feature a unique, curated shopping experience with 150+ trendsetting makers and designers of local goods. This free to enter event will also include live music, local food, and a full bar. Local First Arizona and the Arizona State Fair have partnered to bring fun to Localists across the state. Anyone who wears a Local First Arizona Localist shirt to the Arizona State Fair throughout the entire duration will receive free general admission entry. General admission to the Arizona State Fair includes access to the fairgrounds and all activities within. General admission also includes free general admission seating on a first come, first serve, basis to the Veteran&apos;s Memorial Concert Series, with performances Wednesdays through Sundays. Attendees will be responsible for purchasing their own food, beverages, and ride passes. Local First Arizona is organizing a Localist Day at the Arizona State Fair for Oct. 8. While Localists may attend for free any day that the Fair is open, Localists are invited to join Local First Arizona staff and supporters on Oct. 8, to enjoy the Fair’s activities with fellow Localists. This offer extends the entire duration of the fair, Oct. 7-30. Calling wine and yoga enthusiasts, who says you can’t sip and shop? Every Wednesday, Lululemon shoppers can enjoy wine provided by Sorso Wine Room on their patio while they shop in the late afternoon. Sorso will also provide Lululemon shoppers a gift certificate that offer them 10 percent off of food or a buy one bottle get a second bottle (of equal or lesser value) 50 percent off at Sorso’s Wine Market. The certificate will be good every Wednesday between 6 p.m. and 9 p.m., giving shoppers the opportunity to enjoy some wine while they shop before they head to Sorso Wine Room for a discounted dinner. Taylor Swift never goes out of style at the Musical Instrument Museum. Since its debut in 2012, the Taylor Swift display has been one of the most popular exhibits at MIM. Recently, some of the items were rotated out to showcase Swift’s artistic trajectory. The new exhibit highlights the RED album, which earned Swift American Music Awards as both “Favorite Country Female Artist” and “Favorite Pop/Rock Female Artist.” The lead single “We Are Never Ever Getting Back Together” became Swift’s first number-one hit on the Billboard Hot 100 chart. Included in the exhibit are several custom instruments (two guitars, a banjo, and a piano) as well as a microphone (decked out with red rhinestones). Also on display are two full costume changes, including the outfit Swift wore when she sang “Begin Again” on the RED Tour. With career record sales of over 40 million and more than 130 million song downloads, Swift has become one of the most successful musical artists in the world. Just in time for Halloween, Center Dance Ensemble, opens its season at the Herberger Theater with Masquerades - Featuring The Return of Dracula. Artistic Director Frances Smith Cohen&apos;s piece, The Return of Dracula, is a haunting work which features Emilio Minto as the Vampire, Scott Bodily as his alternate persona of the legendary Count and Amber Robins as the innocent maiden, Mina.Showcasing the athletic and otherworldly movement of Center Dance Ensemble&apos;s corps dancers, The Return of Dracula is set in the mysterious castle of the Count, and follows Dracula as he captivates and seduces all who cross his path. The cast also includes Katie McDowell, Madison MacDonald, and La Tonya Pentzer as the Brides of Dracula. Performances will take place Oct. 20, 21, and 22 at 7:30 p.m. and Oct. 23 at 2:00 p.m.
Get ready for some fall fun. Every Thursday through Sunday in October, Schnepf Farms are providing fun for the whole family. At the Schnepf Farms Pumpkin and Chili Festival, the whole family can chow down on some home-style cooking including chili, chicken and cornbread. After your meal, explore one of the farms corn mazes, have a screaming good time on a roller coaster, play a round of miniature golf or hang out with the animals at the petting zoo; the possibilities are endless. MusicaNova Orchestra opens its 14th season with a history lesson, a nod to the season, and an American premiere featuring an instrument seldom heard on the symphony stage. The Seven Nation Riff concert reveals all on Oct. 30 from 4 to 6 p.m. at Central United Methodist Church, at Central Avenue at Palm Lane in the Phoenix Central Arts District. The White Stripes song "Seven Nation Army" spent weeks atop the Modern Rock Tracks chart when it was released in 2003. Its iconic guitar riff has since has become the favorite chant of sports fans across Europe and been used in media from Ken Burns documentaries to the current mega-hit film Suicide Squad. But its inspiration is from the main theme of Anton Bruckner&apos;s Symphony No. 5, written in 1876 during his Sturm und Drang (storm and stress) period, as he dealt with competing forces in his life and mind. Pinners Conference + Expo is the only major creative conference of its kind that connects consumers, brands, and influencers in one location and will take place at WestWorld Oct. 7-8, 2016. Pinners Conference + Expo is a place where creatives can learn, create and connect. Women from across the nation attend Pinners to learn, create and shop all the creative ideas they have seen, pinned and discovered online. The conference includes 100 classes and a full trade show floor featuring over 230 popular shops. Pinners select the best of the best to teach classes at each conference. The Phoenix conference will be a Pinners’ first in the state. Tickets are available for $7-$99. Downtown Mesa is a budding new epicenter for the creative class. This eclectic neighborhood, one of the metro Phoenix’s original stomping grounds, is now home to the Mesa Music Festival, billed as one of the up-and-coming outlets for new independent and alternative music artists on the verge of discovery. More than 200 bands will take Main Street by storm, Nov. 10 – 12. Founded by New Jersey-based Motor Media, all performances are free with VIP passes at a cost. Multiple venues will host bands throughout the weekend, essentially creating a three-quarter mile block party. Activity zones and public-art displays also line Main Street during the event. Downtown Mesa is becoming more event-centric, from the Southwest Makers Fest to Comic Con and gamer conventions, the area is a beacon for creatives seeking a new, welcoming home base. Construction will begin in 2017 on the new ArtSpace Lofts, a national grant-funded program centered on building communities with artists in residence. Larger than life murals, a built-in local incubator organization called Creative Catalysts, and a collection of award-winning museums including the seven-acre campus at Mesa Arts Center, make up the area’s colorful cultural assets. Experience the essence of autumn at the Agave, The Arizona Spa’s new seasonal treatment. The Essence of Autumn Facial, guests will be surrounded by sounds of birdsong and a breeze rustling through trees, they will be enveloped in the faint scent of spicy cinnamon and clove and will be able to watch a vibrant video canopy of red and gold leaves projected on the ceiling overhead all while enjoying a relaxing facial. The Facial includes a gentle cleanse and exfoliation. Once radiantly clean, the treatment’s signature Pumpkin Latte Hydration Masque by Eminence is followed by a massage of the face, neck and shoulders. Before beginning their facial experience, guests are treated to Agave Spa’s Pumpkin Spice Smoothie or should they choose a cocktail following their treatment, the Spa will offer a complimentary Apple Cider Mimosa. The Essence of Autumn Facial is priced from $159 and will only be available until Nov. 27. This October, Jurlique Spa at FireSky Resort is offering a relaxing way to celebrate the fall with the Scarlet Beauty Package. This offer includes guest’s choice of the following services: 60-minute Apple Sugar Exfoliation; a 50-minute Manicure; and a 50-minute Pedicure Or 60-minute Facial; 50-minute Manicure; and 50-minute Pedicure. Monday through Thursday this deal costs $179, and Friday through Saturday the price is $199. Don’t wait this deal ends Oct. 31. In honor of Breast Cancer Awareness Month, Joya Spa at Omni Scottsdale Resort & Spa at Montelucia will donate 15 percent of the proceeds from the following services to the H.E.A.L. Foundation; (Happily Ever After League), which helps to provide financial support to mothers receiving cancer treatment. Think Pink this month with a Positively Pink Facial, your choice of a 50-minute Transformation Facial or Men’s Custom Facial starting at $159; a Tickled Pink Massage, a 50-minute Classic Massage starting at $159 or a Pretty in Pink Mani-Pedi, a hydrating manicure or pedicure for $59 each. What’s the best way to enjoy Spiced Pumpkin? Not in a Latte, on your feet. October through November the VH Spa at the Hotel Valley Ho is offering a Spiced Pumpkin Pedicure. Pumpkin has long been known to oxygenate and bring out a healthy glow to skin. Add in spices for increased circulation and your toes will be warm and oh so cozy. Finish with a plethora of rich color options from Morgan Taylor. Variety is, after all, the spice of life. The Boulder’s Spa is now offering a cool way to work on your warrior. Enjoy a 60-minute yoga class on a paddleboard in the water with a WPA certified coach and E-RYT 500 yoga instructor. This yoga experience is $55 per person. Burger fans rejoice. Six of the Valley best chefs will be going head-to-head this October in a fun burger battle competition at Okra. Two chefs will compete each week, starting Oct. 9, in head-to-head competitions, with the winner moving on to the championship match on Oct. 30. Hosted at Okra Cookhouse & Cocktails, the Burger Battle will feature some of the Valley&apos;s top chefs including Kelly Fletcher of Zen, Gio Osso of Virtu and Nico Heirloom Kitchen, host Cullen Campbell of Crudo and Okra Cookhouse & Cocktails, Doug Robson of Otro, Justin Beckett of Beckett&apos;s Table and Southern Rail, and Chris Newstrom of Upward Projects. Celebrity judges will be on hand to judge each week&apos;s competition. Diners can come in and watch the competition, plus try each chef&apos;s creation. In addition, Okra will feature their traditional Sunday specials including all day happy hour, half-off bottles of wine and mixologist Micah Olson will be creating some special Tito&apos;s cocktails & punch to serve at the Burger Battle. Get ready for a fiesta. The Arizona Taco Festival comes to the Salt River Fields Oct. 15 and 16. You&apos;ll find about 50 restaurants dishing out $2 tacos and bars and beverage station serving margaritas, beer, water, and soda. Smack down with some Lucha Libre Wrestling or cheer on the cutest contestant at the Chihuahua Beauty Pageant. For the extra hungry there will be taco and chile pepper eating contests. There will also be full bar experiences by Dos Gringos, El Hefe, Salty Senorita, Wasted Grain and Old Town Gringos. The Grand Tasting is the main event of this deliciously adventurous three-day celebration of Arizona’s food scene at azcentral Food and Wine Experience Nov. 4 to 6. The finest foods, most creative chefs, more than 200 craft beers, fine wines and spirits, and 70 restaurants are featured over the two Grand Tasting days Saturday and Sunday. For those who seek more private dining or personally interactive styles of enjoying fine cuisine, look no further than the intimate dining a la carte Experiences sprinkled throughout the event schedule featuring everything from unusual smoky barbecue to Asian bites with a Western twist. The schedule of a la carte dining Experiences include Lunch with Mario Batali, creating a custom bourbon with a master bourbon maker, learning about indigenous ingredients from Talking Stick and much more. One of the newest noodle spots on the scene in the last year, Otakumen + Pat and Waldo’s has merged to become one brand under Noodle Bar with one door, one name, one menu (with new craveworthy dishes) and one speedy walk-up ordering process. Kai restaurant at Sheraton Grand at Wild Horse Pass Resort has been named one of the “100 Best Restaurants for Foodies in America” by OpenTable. The list of winners is derived from more than 5 million reviews submitted by OpenTable diners for approximately 20,000 restaurants across the nation. Weekends keep getting bigger, better and brunch-ier at Twisted Grove Parlor + Bar, where they just rolled out an all-new seasonal Brunch menu. Not to mention, a build-your-own Bloody Mary bar, where guests can craft their own custom cocktail with dozens of savory and delicious toppings and mixers for only $8 per drink. Served weekends from 11 a.m. to 3 p.m., Twisted Grove&apos;s brunch is the perfect way to unwind this weekend while enjoying the return of fall weather on the two outdoor dining patios. Looking to toast to the weekend the right way? Come celebrate the weekend while brunching with the #jomies at Joe&apos;s Midnight Run in Central Phoenix, every Saturday & Sunday from 9:30a.m.to 2:30 p.m. Enjoy brand new additions to the "It&apos;s Midnight Somewhere" weekend brunch menu, including $3 mimosas and Bellinis, plus $8 signature cocktails & Bloody Mary&apos;s, glasses & bottles of wine, 16 oz pint & 40 oz Beer and much more. Chef Michael Goldsmith is also serving up brunch time favorites with an expansive list of both breakfast and lunch choices to choose from. Breakfast options include Banana French Toast with brown sugar caramel and brioche, Biscuits and Gravy featuring house-made biscuits, chorizo gravy, fried eggs and Fresno Chiles, Shrimp & Grits with scallions and grilled shrimp, Shakshuka featuring tomatoes, zucchini, spices and eggs and many more breakfast favorites. Huss Brewing Co., the award-winning quality lager and aleworks brewery based in Tempe, acquired the landmark craft beer brand, Papago Brewing Company. Led by the husband and wife team of Leah and Jeff Huss, Huss Brewing Co. was founded in 2013 and was already recognized as the state&apos;s fastest-growing brewery and #13 in the nation among New Craft beer entries, according to the national research firm, IRI. Now, following the acquisition of Papago Brewing Company and its best-selling Papago Orange Blossom mandarin wheat beer, the newly combined Huss Family of Beers is forecasted to finish 2016 as the new #3 largest brewery in Arizona based on industry standard Nielsen scan data. Authentic Indian Restaurant, Marigold Maison Paradise Valley, is expanding its location this month and adding 64 seats in the dining room, a 24-person private dining room, and a full service bar. Previously only serving beer and wine, Marigold Maison will also debut a cocktail program as well as an indoor and outdoor bar space for guests to casually dine and pair beverages with Indian dishes. Guests can now enjoy 22 wines by the glass, eight reserve caliber wines available by the bottle, four classic, specialty cocktails, and local and regional craft and Indian beers. The Indian restaurant also plans to launch a small bites menu and happy hour later this year. Char Kitchen + Bar is now open in the space that formerly housed Bink’s Scottsdale. This brand new eatery takes a distinct departure from the former occupant’s menu with dishes influenced by owners, father and son, Peter and Pal Micakaj’s Albanian heritage. The menu is resplendent with nods to Eastern Europe and the Mediterranean. The restaurant is open daily for lunch and dinner starting at 11:00 a.m. Happy Hour will be available in the bar area daily from 3:30 p.m. to 6:00 p.m.
Twenty years ago, Coffee Reserve Brands became incorporated, and served its first batch of roasted coffee in 1997. With 2017 around the corner and a 20-year anniversary on the horizon, Coffee Reserve Brands is brewing up a new name—CULT Coffee Roaster. As part of its rebranding and efforts to stay ahead of the industry trends, late last year Cult Coffee Roaster debuted Brow Lifter Nitro Coffee, which is currently served in local restaurants including Phoenix Ale House Central Kitchen, Jarrod’s Coffee Tea + Gallery, Elevate Coffee House, Wildflower Bread Company, and outside the Phoenix area on the main campus of the University of Arizona in Tucson, and at Forest Highlands Golf Course in Flagstaff. Nationally, CULT Coffee Roaster’s coffees, teas, botanical infusions, and nitros can be found at and distributed by major brands such as Pei Wei, BJ’s Brewhouse, Trader Coffee International, Shamrock Foods, Nicholas & Company, and Left Coast Food & Juice. October is for all things fall. Pumpkin, changing leaves and…pizza. It’s no wonder with more than 93 percent of Americans having consumed pizza at some point in the last month alone. October is National Pizza Month and locally owned Fired Pie is celebrating. On Oct. 11, which also happens to be National Sausage Pizza Day, all Fired Pie locations will offer half off their sausage pizza with the purchase of any drink. This is for sausage pizzas only. Fired Pie has 15 Valley locations and two in Tucson. The locally owned restaurant allows you to take on the role of chef by picking and choosing your own type of dough, sauce and topping. The sophisticated-yet-affordable pizzeria also offers build-your-own salads. They are set to open a Mesa location later this year. The NCAA Final Four 2017 will be hosted in Greater Phoenix March 31 to April 4. Not only will Phoenix be the host of the Final Four itself but also exciting events like the Final Four Fan Fest, the March Madness Music Festival, the Final Four Dribble, Final Four Fridays and much more. The Arizona Diamondbacks announced their 2017 regular season schedule today, with the team kicking off the season hosting the San Francisco Giants on Sunday, April 2, for Opening Day at Chase Field. The team will have an off day on Monday before resuming the Opening Homestand on April 4 to 9 against the Giants and Cleveland Indians. The D-backs’ 20th season will open against the Giants on a Sunday for the first time in franchise history on April 2 at Chase Field. The D-backs will close the 2017 regular season on the road for the seventh time in franchise history with a three-game series in Kansas City. Twenty-nine of the final 34 games will be against National League West opponents with the final regular season homestand at Chase Field against the Miami Marlins and Giants.